Samples of Building Plans (floor plans, site plans, landscape and garden designs, fire and emergency plans, furniture and equipment layouts, plans of building services: electrical and telecommunication, HVAC, plumbing & piping, reflected ceiling, security and access) are created using ConceptDraw DIAGRAM v12 diagramming and vector drawing software enhanced with Building Plans solution from ConceptDraw Solution Park. ConceptDraw DIAGRAM v12 enhanced with Building Plans solution help architects and building engineers to develop design proposals, communicate ideas and concepts that relate to a design, communicate requirements to a building contractor, record completed work, and make a record of what currently exists. ConceptDraw DIAGRAM v12 provides export of vector graphic multipage documents into multiple file formats: vector graphics (SVG, EMF, EPS), bitmap graphics (PNG, JPEG, GIF, BMP, TIFF), web documents (HTML, PDF), PowerPoint presentations (PPT), Adobe Flash (SWF). Floor Plan sample: Office space. This example is created using ConceptDraw DIAGRAM diagramming software enhanced with Building Plans solution from ConceptDraw Solution Park. Floor Plan sample: Fire evacuation plan. Floor Plan sample: Home building plan. Floor Plan sample: Flat plan. Floor Plan sample: Apartment plan. Building Plan sample: House plan. Building Plan sample: Home emergency plan. Building Plan sample: Electrical and telecom plan. Floor Plan sample: Office layout. Floor Plan sample: Office floor. Floor Plan sample: Office wireless network. Floor Plan sample: Office plan. Floor Plan sample: Office emergency plan. This example is created using ConceptDraw DIAGRAM diagramming and vector drawing software enhanced with Building Plans solution from ConceptDraw Solution Park. Floor Plan sample: Cubicle layout. Floor Plan sample: Conference room. Floor Plan sample: Banquet hall. 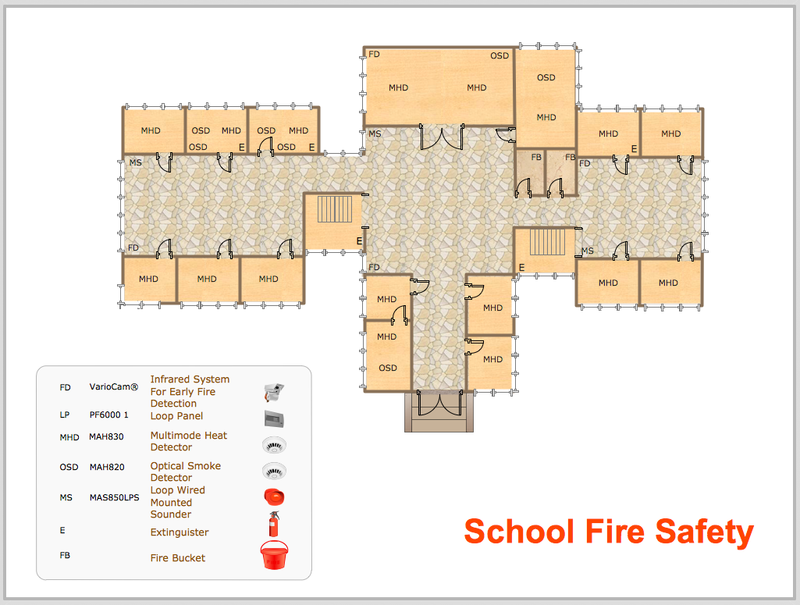 Floor Plan sample: School fire safety. 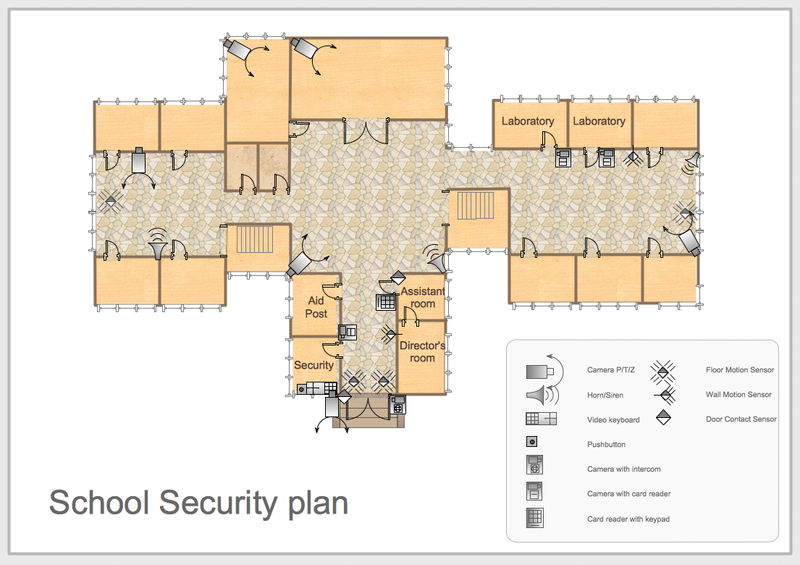 Floor Plan sample: School security plan.